Identification: Wings are rounded and brown-black. 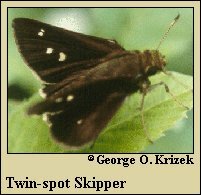 Upperside of forewing has 4 transparent spots. Underside of hindwing has a pale red-brown overlay and 3 oval white spots, 2 of which are close together. Flight: Two broods from April-September, possibly three broods in Florida. Adult food: Nectar including that from pickerelweed flowers. Habitat: Coastal swamps and pinewoods. Range: Coastal North Carolina south through Florida and west along the Gulf Coast to east Texas. A rare stray to Pennsylvania, Maryland, and New Jersey.